The MOVE Automated Guided Vehicle, available from Trilogiq Australia , can reduce repetitive handling costs. 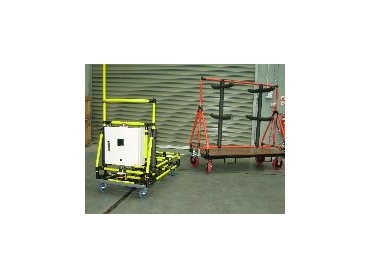 The MOVE unit is a flexible and simple style Automated Guided Vehicle. The MOVE Automated Guided Vehicle stands for Mobile Operating Vehicle and is designed for use in manufacturing, warehousing, picking and packing operations. This driverless battery powered vehicle is designed to deliver and pickup goods around various routes within the facility. Each MOVE Automated Guided Vehicle is custom built to suit customers’ application. Combined with Trilogiq’s Industrial trailers, the MOVE system provides a fully customisable solution for material handling needs. The simplicity of the system supports Lean Manufacturing processes particularly when teamed with flexibility of the LeanTek tube and bracket system.